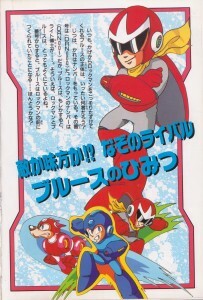 Following Rockman 5, Blues’ true alliances were starting to shine through. But the complete details of Blues’ life were still very much a mystery, and the unknown continued to be the focus of his profiles. 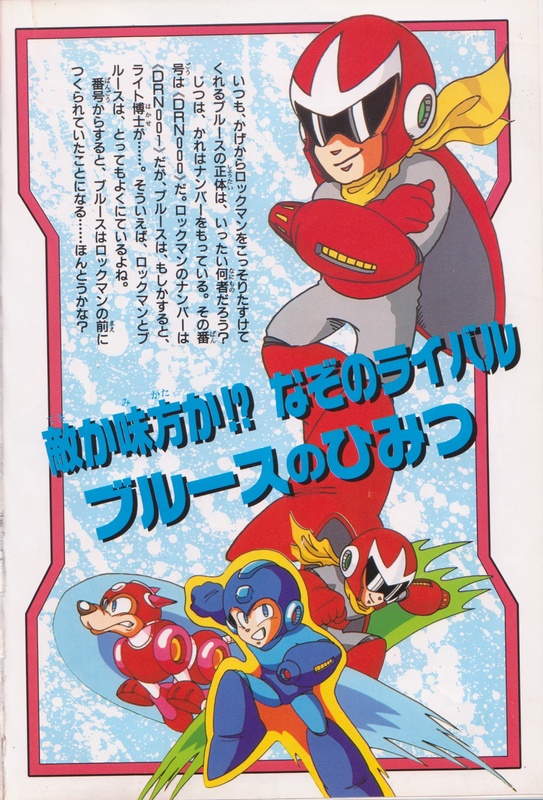 Just who is this character called Blues, who always appears stealthily from out of the shadows to help Rockman in his times of need? The truth is, he actually has a model number. That number is «DRN.000». 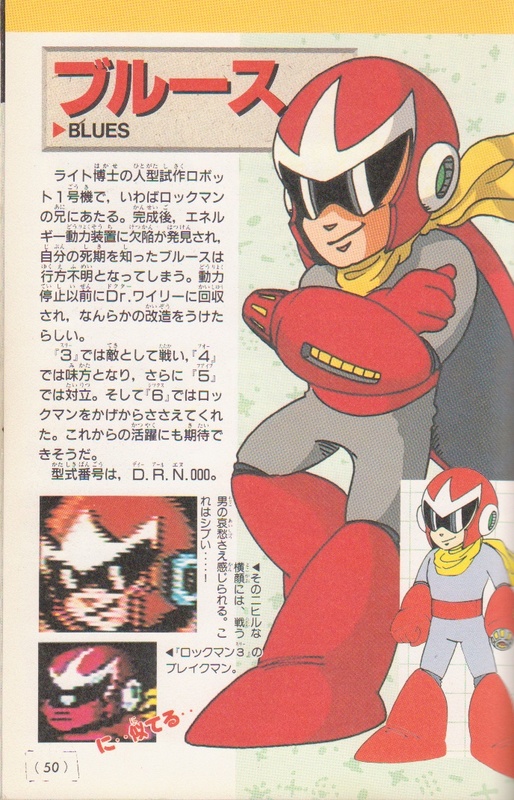 Rockman’s number is «DRN.001», so could that possibly mean that Blues is one of Dr. Right’s…? Speaking of which, Blues and Rockman certainly resemble each other a great deal, don’t they? Judging from the numbers, perhaps Blues was built before Rockman… Could this be true? Dr. Right’s first humanoid robot prototype, he could be considered the older brother of Rockman. After completion, his energy generation device was found to be defective, and upon hearing his own time of death, he disappeared to parts unknown. It seems that just before his power shut down completely, he was found by Dr. Wily and given some kind of remodeling. In “3” he did battle as an enemy, while in “4” he was an ally, then in “5” the confrontation finally came to a head. And now in “6” he supported Rockman from the shadows. Hopefully he’ll continue to come to our hero’s aid in the future. His model number is DRN.000. Top screen caption: Under the chilly facade lies a warrior to whom pathos is no stranger. What a hardened guy…! Blues is the weathered rugged man’s man (or robot’s robot) of the series. He’s stared into the dark abyss of existence, he’s recognized the hard truths about life, knows the world is not black and white and makes his choices accordingly… and has an awesome fashion sense. He’s seen things with these shades, man, things you wouldn’t believe… Is it any wonder this week is all about him? We’ll pick up some more details tomorrow. 1 Comment to "The Mystery of Blues Continues"
What is the origin of this “4 panels schedule image characters” on the Rockman books? I see many of this in R20. Actually only for the Famicom and Game Boy games except World 5.